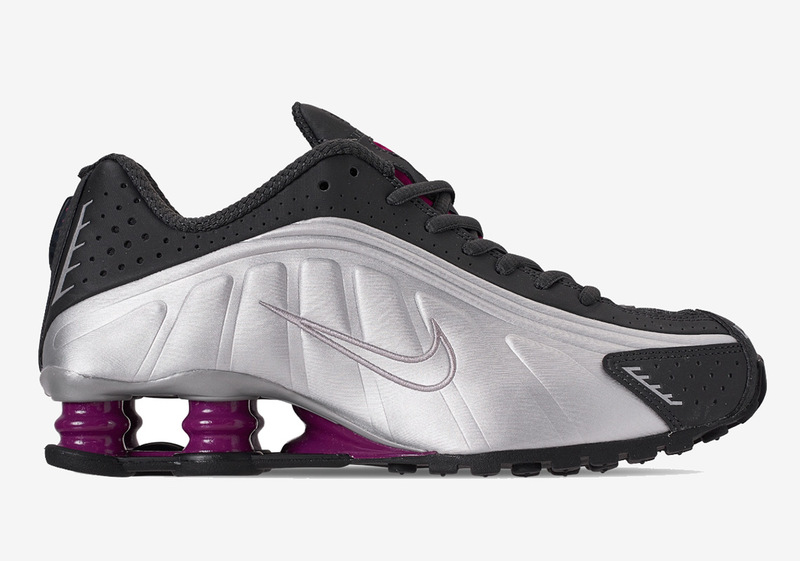 Alongside a bevy of other welcomed Swoosh brand returns, Nike’s Shox family has enjoyed a busier than normal beginning of 2019, touching down in a duo of original constructions as well as flashy new varieties. Fitting in with the latter camp is this upcoming colorway of the Shox R4 that is set to equip a clean combination of True Berry, Anthracite, and Metallic Silver. Designed with the ladies in mind, this nostalgically versatile piece of Swoosh footwear opts for a shimmering silver for the vast majority of its upper with its namesake arriving via its proprietary cushioning system that has helped separate the Shox line from the rest of the Beaverton family since its inception. Resembling a set of Roman columns or engine pistons, this sneaker’s cushioning system – made famous by Nike’s memorable “Boing” ad campaign – is truly one of the most unique in history. Set to touch down on April 13th, grab a detailed look ahead and tell us if you’ll be grabbing these new R4s when they hit shelves.